Eggless Vanilla cake is one of the most popular cakes around the world. And when you have eggless Vanilla sponge cake with you, you can be creative and do many things to bring your creativity into reality. When I baked moist vanilla cake recipe a few days ago, my mother-in-law did not eat the cake because of the presence of eggs. Looking at the reaction of others, who were enjoying the cake, my mother-in-law asked if I know how to make a vanilla eggless cake? Typically a Vanilla cake is baked using eggs. But the smell of eggs in cakes and other bakes irritates a lot of people. Those who have a strong nose to eggs, they can smell it even after the baked item has cooled down. Their alternative is to bake vanilla cake recipe eggless and this is what you are going to bake today. Ever wondered why good bakery cakes and bread do not have the smell of eggs in them? Simply because instead of using fresh eggs they would have used egg powder. And that’s even worse according to me. In the process of making the powder out of an egg, it has to shed vitamins. I have used a combination of vinegar, milk and baking soda but there are flip sides to using vinegar. Vinegar may make the cake dry and there are a few people who do not like the smell of vinegar. The better the research the better will be the output of an experiment. I started reading simple eggless cake recipe, but they were all using the condensed milk. But the hard work does not go waste. My search headed me to an eggless vanilla cake recipe that used curd and baking soda. This was it. I got my formula to experiment with an eggless vanilla cake without condensed milk. My initial two attempts did not lead to successful results and made me re-think. In both the attempt I got a sour cake with a prominent smell. After a deep dive into my recipe, I felt it is the curd that might be the culprit. I changed the 2 days old refrigerated curd with fresh curd and got one of the best vanilla cake recipes. PS: Use Conversion Table to convert cups to grams and vice versa. For this recipe, I have used all-purpose flour and organic white sugar. Replaced eggs with fresh yogurt and baking soda. When baking soda combines with curd, it reacts and releases carbon dioxide that results in a fluffy vanilla cake. 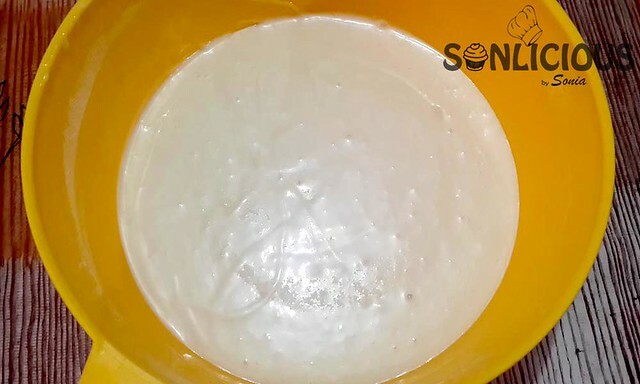 I have purposely used more baking soda than my other recipes because after experimenting with different amounts, I got best results with this particular proportion of baking soda. This is a vanilla cake recipe with oil. Oil is used as the fat content and I have used regular flavorless oil. Vanilla essence was used as the flavoring agent, however, you can use any other essence to make it of a different flavor. In a bowl mix Curd, Oil, Sugar, Milk, and Vanilla Essence. In a separate bowl mix Flour, Baking Powder, Baking Soda, and salt together. Sift all the dry ingredients and mix into wet ingredients. In eggless baking, sifting aerates the flour that results in light and fluffy cakes. Make a smooth batter. There should be no lumps. Line a baking tin with parchment paper or you can simply grease it with butter. I have used baking tin which is 8 inches in diameter. Pour the batter into it. Tap the tin on counter to release the air bubbles. Now place this tin in a preheated oven at 180 degree Celsius for 25 minutes or until a toothpick inserted into it comes out clean. Once done, take out the baking tin and let it rest for 5 minutes and then de-mould the cake and serve. This is my no-fail recipe and I mostly use this spongy cake as a base for my fresh cream cakes. Watch the video to see how I made a birthday cake using this eggless vanilla cake sponge. 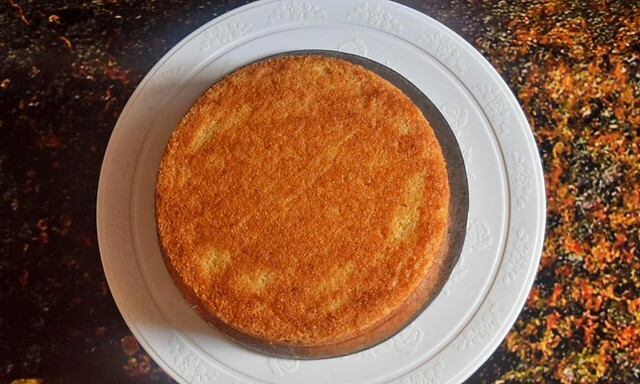 Step-by-Step recipe of eggless vanilla cake without condensed milk. This is the best vanilla cake recipe with oil. The recipe yields soft, moist and fluffy vanilla cake. The recipe includes video recipe of the vanilla cake and video recipe of frosting. In a bowl mix Curd, Oil, Sugar, Milk and Vanilla Essence. In a separate bowl mix Flour, Baking Powder, Baking Soda and salt altogether. Sift all the dry ingredients and mix into wet ingredients. Make a smooth batter. There should be no lumps. 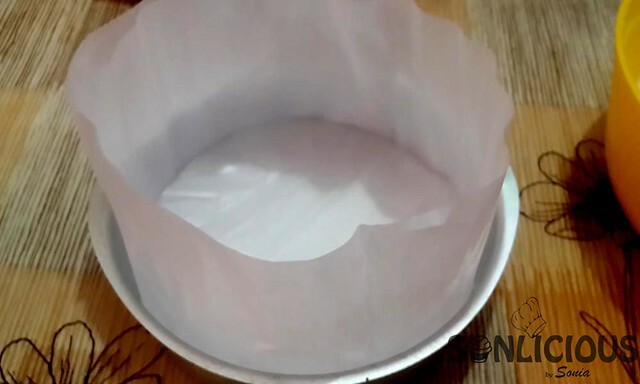 Line a baking tin with parchment paper and pour the batter into it. I have used baking tin which is 8 inches in diameter. Now place this tin in a preheated oven at 180 degree Celsius for 25 minutes or until toothpick inserted into it comes out clean. Once done, take out the baking tin and let it rest for 5 minutes. Now de-mould the cake and serve. You can bake this cake in a pressure cooker as well. 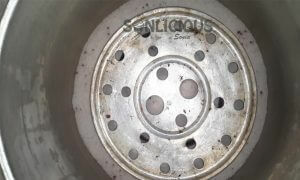 As shown in the picture, put some salt in the cooker base and place a stand on it. Now you can place your baking tin on the stand and close the lid of Pressure cooker. Don’t forget to remove the whistle. Bake this cake on a medium flame for 30-35 minutes. Amount of milk suggested in the recipe is 180 ml. However you can increase or reduce the amount based upon quality of flour you are using. Every flour has different absorption capacity. To add tutti frutti into this cake, toss the tutti frutti with one table spoon of all purpose flour and add to the batter. Can you specify the pan size you used in your recipe else its hard to know which one to use..
Also if i want to make 1/4 sheet cake with this recipe howmuch will i have to add each ingredient? the tin size I have used is 8″ in diameter. You can use 80 ml oil keeping rest all the other ingredients same and bake in 9×13 inches tray. Hi Sonia, Thank you for the recipe. I tried it today and the texture is perfect, rose well. but while cutting it i got a lot of oil o my fingers, the way you get when you handle a deep fried snack. Please let me know what could be the reason. If you felt the cake was oily, then next time use 80 ml oil, keeping rest all other ingredients same. Hope it will help you. Thanks Munmun for sharing your feedback. If the cake was soggy it clearly means it wasn’t baked completely. Always do the toothpick test and if require then bake your cake for an extra 5 min. Baking time can vary oven to oven. Thanks much for liking the work. Coming to your questions, there is no straight answer to it. Simply replacing the flour does not solve the purpose. Every ingredient work differently and other ingredients also need to be modified accordingly. I tried this this today in convection microwave. It was good in taste and texture. But the top and bottom surface became sticky after 1 hour or so. Why it is like that? – If the moisture in the air was high, the cake can sweat. – if the cake was warm and was covered with something the heat can also make the cake sweat and finally sticky. Juhi I don’t use cake premixes nor I recommend to use. It is always better to bake a cake with readily available basic ingredients without adding any preservatives. I am Archana, home baker, I doing baking business. I have tried so many eggless cake recipes none recipes came perfect. But today I achieved a perfect eggless cake. This cake means a lot to me Sonia. Thank you so much dear. I just halved your recipe, baked at 180 degree Celsius for 30 minutes. Thank you so much for your generous feedback. It means a lot. I have been using your cake recipes for baking since a long time and had very beautiful results. Now my family never buy cakes from market. Mam could you please guide on how can we double the cake recipe like the vanilla sponge cake recipe..should I just double the ingredients or not? Please provide more different flavour cake recipes like marble, strawberry, butterscotch, etc. especially without condensed milk. I am big fan of your cakes because of the easy availability of the ingredients that you use for baking. Thanks for liking the work. Your appreciation gives me more strength to continue creating recipes for you. I appreciate your suggestion and point noted. I will put these cakes in the schedule and share recipes on the blog at the earliest. In my blog, you should check the recipe card, which is generally at the end of the detailed recipe. In the recipe card, you can modify the recipe servings and all other ingredients will adjust accordingly. Yes, you can just double up the ingredients for the vanilla cake. 1. In which mode i can bake my cake [ microwave or oven or covection] and plz guide me for time n temp. I m vry much confuised😑 ? Rishu, Every recipe is made for a purpose, and if you intend to make a cake with condensed milk, then please check other recipes on my blog which are made with condensed milk. Cakes are made in convection mode. The temperature and time will always be mentioned in the recipe. Tried this receipe today but it was very dense and fell flat within 30 seconds of taking it out of the oven to cool. I took at the comments before I began to see what other ppl felt about the recipe and problems they encountered. But even with being careful and following the steps properly it wasn’t moist and airy. My baking powder is fresh, I didn’t over mix my batter and didn’t let any heat escape from the oven. Check the ingredient list again. Follow all the steps as described and try once again. Can I use whole wheat flour (atta) instead of all purpose flour(maida) for the same recipe to make heathier cake? Surbhi, you may use whole wheat flour instead of all-purpose flour, but you would like to be mindful of the fact that the liquid content needs to be increased accordingly. Hi Pruba, Some people have baked in 6″ pan and they got good results. a good teacher alwys answer all the quires.we can learn better with your answers. Thanks much for your compliment. I try to be as responsive as I can be. Are you sure you used the convection mode? In convection mode at 160C, the cake should not burn. If you used convection mode and got your cake spoiled, you may want to get your microwave serviced. I brought a brand new microwave of in brand a month ago.. I using an aluminium utensil for baking as using plastic utensil make it melt away. If you cannot use aluminium or steel utensils in microwave and you cannot use plastic utensils in convection mode. So if your plastic utensil melted, it means you were using the convection mode, however I have never heard a cake burning at 160C on convection mode. You may like to call the company folks and take a free demo of how to use your equipment. Alternatively, there will be many videos pertaining to your brand and model of microwave and you might like to refer to them as well. 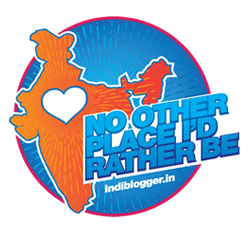 Hi Purba, This recipe will work for 6″ pan as well. You will just get a little taller cake. Thanks for the recipe mam..I have a query. Everytime I bake an eggless vanilla cake, the inside of my cake turns brown. What am I doing wrong? While baking do I need to keep both the rods on or just the lower rod? Some people suggest for just the lower rod. Am confused. First thing first, the inside can go brown because of the vanilla extract. Try using a better quality vanilla extract and see if the problem repeats. Secondly, It is always advisable to use only lower rod while baking the cake. However, if you have a convection OTG, it might not matter that much, because the fan in the oven ensure even temperature. Sonia I use vanilla essence and not vanilla extract. That can be the reason? Vanilla extract is the complete spectrum of oils, aromas and flavor compounds naturally found in real vanilla beans presented in a solution of alcohol and water. It is much richer in taste and fragrance compared with ‘vanilla essence’ or ‘imitation vanilla’ which only contains synthetically derived ‘vanillin’ hence the lack of diverse flavors. Having said that, vanilla essence or extract should not change the texture of your cake. If you want to use vanilla essence, just check the brand quality and you should be fine. Hello dear…. Thnx for sharing the recipe…I tried just now…. When my cake was in oven it rised very well…With little cracks on top… After 35 min i make a skewer test and it came out clean… So I switched off the oven and then also my cake was in oven for 5 min …. But it sinked from all sides and became dense …. Where I did wrong… I faced this problem for first time….Feeling depressed….?? First of all my sincere thanks for liking my work. Highly appreciate your appreciation. Secondly, yes you can replace yogurt (1/2 cup of yogurt with 2 eggs). Also when you replace APF with cocoa, remember to balance the equation. For example replace 2 tbs of APF with 2 tbs of Cocoa. Thanks for the wonderful recipes. I have tried your whole wheat eggless muffins and they came out absolutely spongy and tasty in the first try itself. Since there is no facility to upload the pictures on tis website, i was unable to send them to you. I have two questions for this cake recipe. Since i avoid all purpose flour and use only whole wheat flour and also the oil i use is Olive Oil, the combination makes the outcome pretty dense with a strong flavour. In this recipe 1) Can i replace all purpose flour with the whole wheat flour and 2) Can i replace the olive oil with Rice Barn Oil or use olive oil and add orange juice to neutralise the flavour? Moreover, i use a convection oven and not an OTG. So i guess i need to reduce the timing by 05 minutes or reduce the temperature by a couple of degrees if i bake it for 30 minutes?. Thanks. Thanks for your feedback and appreciation. I recommend you liking our Facebook Page: https://facebook.com/solicioiuss and please share the pictures of your muffins. I would really appreciate that. 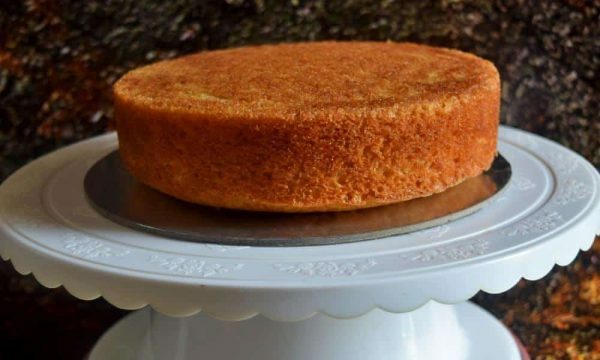 For Vanilla Cake Recipe: Yes you can use 100% whole wheat flour and use Rice Bran oil or sunflower oil. Because you are using 100% wheat flour, please add 1/4 cup of additional liquid content (milk/curd/orange juice). Ideally, you should not have a strong flavor of wheat because vanilla essence should mask it. do not change the timing of baking, however reduce the temperature to 160 degree Celsius. Let me know if I could be of more assistance. I did bake the cake today and it turned out good. I baked it at 180 degrees for 10 minutes and 160 degrees for 25 minutes. However, after the 30th minute, some cracks developed on the top portion only. Does it usually happen in a whole wheat flour cake? Or is there some flaw which i need to correct ? I tried logging on to your fb page through the link you have mentioned above, but i received the reply that the page isn’t available, so i cant send you the pics of the cake. Anyways, thanks a lot for the recipe, and i got the point that baking soda when reacts with acidic structure, it does help in leavening. However, i would like to know if instead of curd, can we make corn starch(cornflour in India) and baking soda react to provide the leavening and binding. 1. Wrong baking tin size. The recipe calls for a 8″ cake tin, if you are using a smaller tin, the cake might crack from the top. 2. Uneven temperature in the oven. Uneven temperature might bake the corners first and the cake might crack. 1. Frequently opening the oven door while the baking is on. 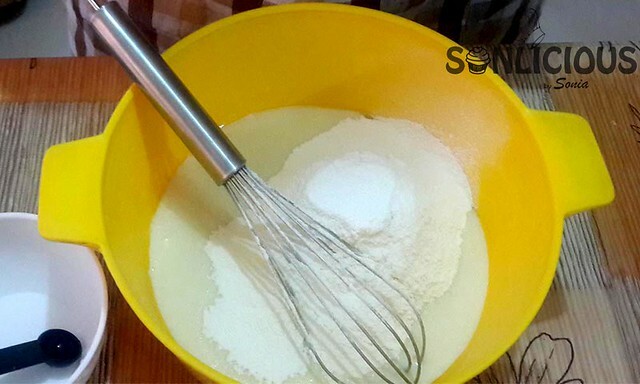 About Baking soda and cornstarch combination, I would advise to use vinegar + milk instead of curd. Thank you for this lovely recipe.. I tried it and it tasted good, soft and spongy. However, the colour of the cake wasn’t white but more yellow.. I used oil.. Any idea?? If you haven’t added anything else that could change the color of the cake, then the culprit could only be oil. May be the oil you are using has a base color that is yellow.. Thanks so much for the recipe in proper proportion. I’ll try this one. Thanks Preeti. Share the results with us. Hi Renu, the measurements mentioned produces a cake of 1 pound. Now you can increase and decrease the ingredients quantity to make a cake of required size. It shall be aprox 1 pound cake. The purpose to add salt in cake or muffin batter is to enhance the flavor of all other ingredients. It is an eggless cake but to make it more soft, spongy and light, I have used double quantity of baking soda as compare to baking powder. When soda and curd will combine, they will react and give rise to the cake. Can you please suggest the recipe with measuring cups. However, you might like to check this post and it will always help you in finding the right conversion. will give it a try soon… just update a bit.. sugar would be in dry ingredients.. If your question is whether to mix sugar with the wet ingredients or with dry ingredients then the answer is wet ingredients. You mix oil, milk, curd and sugar all together.